The above photo is of a park/water runoff storage at the end of my street. Reggie and I walk by there every day and some days, the colors are so vivid and bright, they fill me with a sense of joy and energy. 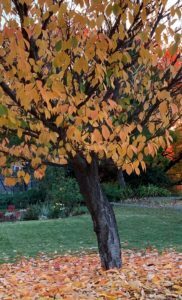 I take photos of these same trees at different times of the day with the light on the leaf colors so brilliant. 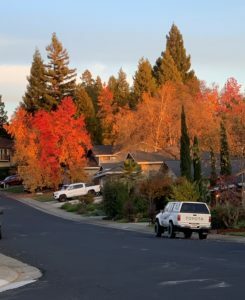 When I turn to drive up to my street, the above photo shows the beauty of the trees and the area. 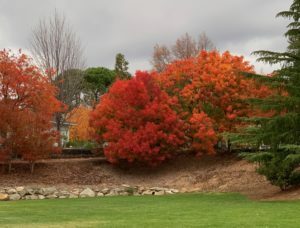 It makes me so happy to see the area where I live, to see the trees and the majesty with which they stand and display their beautiful colors and shapes. Every morning when I walk a few more leaves have fallen off the trees, photo below, and I cherish them all, the ones that are still on and those that are laying on the ground. Some trees have released all of their leaves and are in a rest mode having completed their work for the year. They have been vassals to be used by Spirit for our great enjoyment and well-being. The trees remind me of a song, I Will Be, by Michael Gott and of why I came back to Earth after my second near-death experience. The trees remind me that they, and I, am here to be used for whatever Spirit needs of me. The below words touch me so deeply as does the music. I will be, I will be, I will be. I will go, I will go, I will go. 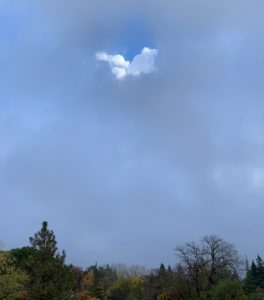 I was almost home from an early morning walk after the rain with the clouds still hovering over the area, when I noticed a heart-shaped opening with wing-like clouds, pure blue sky, and the sun back-lighting the clouds. Spirit greeting me and blessing me with the message that I am always enfolded in wings on high in the Light. It took my breath away and I stopped to just be with the moment.